An intruder caused damage to an apartment by setting a shoe on fire in a cooking pot and triggering the residence’s sprinkler system. The break-in occurred just before 8pm on Thursday at an apartment in San Francisco, California. “They put the shoe in the pot and set it on fire,” said Officer Carlos Manfredi, a spokesman for the San Francisco Police Department. The intruder entered the apartment through a back window, Manfredi added. He said it was unclear why the prowler set the shoe on fire in the cooking pot. Smoke from the fire prompted the sprinkler system to go off, causing water damage to the apartment. It is not known if anything was stolen. So whose shoe was it? 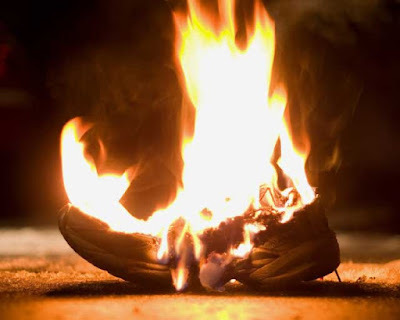 Did he steal the shoe, or did he break into an apartment just to light his own shoe on fire? This is not how you make filet of sole.